Tidbits of Experience was created as a way for our family to share everything we’ve learned in this crazy adventure called life. We write about the beauty of parenthood, the places we travel, and the games we love to play. We write about smart shopping, the art of laundry, and common kitchen hacks we use to save money on food, stay organized, and keep our kitchen clean. 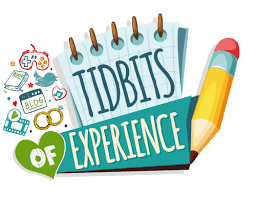 Whether you’re looking for targeted traffic to your website, or would like to promote a product or service, advertising on Tidbits of Experience is an inexpensive way to get your name in front of thousands of moms and dads. We offer a wide range of banner advertising spots, which you can advertise on directly using the form below. We can also make arrangements for custom advertising spots, ie: mobile advertising. Just contact us using the form below. We also accept sponsored posts, which are an excellent way to tell our readers about your product or service in depth. For example, many of our clients promote Kickstarter projects. Just use the form below to send us a brief description of what you’re looking for, and we’ll get back to you promptly with more information.